Byer of Maine’s strongest cot will support your biggest campers in comfort and classic military style. Reinforced aluminum and steel frame and ripstop polyester cover holds up to 375lbs. 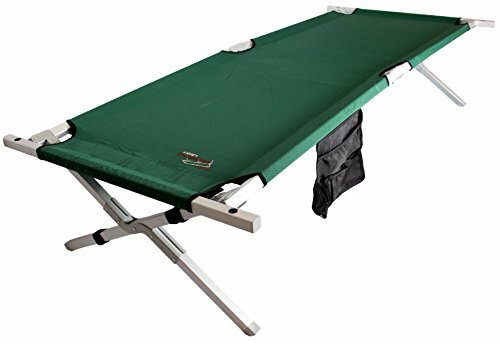 The fabric has been reinforced along the center for increased strength to support you when you want to sit.. At 84 inches long and 30 inches wide, the Military Cot also accommodates the tallest campers. No more scrunching up into an awkward fetal position, then waking up cramped and sore. It’s easy to transport this cot in its own carrying bag, meaning you don’t have to make sacrifices when going on long camping or hunting trips. Assembly is easy, especially with the addition of the hook and loop system at one end of the cot. For more details, check out our instructional video for this model. . If needed, replacement canvas is available for purchase separately. Military in design but civilian in comfort, the Military Cot will endure countless camping trips. Its sturdy frame is constructed from full 1-1/4" square aircraft aluminum tubing reinforced with interior steel tubing. All folding points use heavy gauge heat-treated hinges, which contributes to the cot's strength. The strong ripstop polyester fabric is reinforced along the center of the sleeping surface at the weakest point in the canvas, where most people sit. The Military Cot is also easy to clean. Just as with any other outdoor furniture, use a mild detergent and hose, and your cot should keep for years to come. Cot dimensions are 84"L X 30"W X 18"H, perfect for campers big and small. It sits high enough off the ground that storage space is no longer at a premium. We've added a gear pouch with multiple pockets for easy storage of small bits. Assembly is easy, especially with the addition of the hook and loop system at one end of the cot. For more details, check out our instructional video for this model.